placed, will have been determined at the time the program was written.If you will be using a program you did not write, consult the programmer if you have any questions about which tools to use. offset screen under the appropriate tool number. Repeat this procedure to set the X and Z offsets for each tool. For some programs, you will also have to record the tip radius of certain cutting tools in the tool offset screen. The tip radius should be found either marked on the tool or in the documentation for the tool. 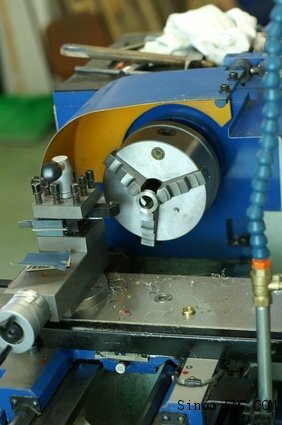 jog the cutter so that it faces off the end of the workpiece, leaving a smooth surface. Record the tool’s position under the Z axis work offset.